New book, 80 pages, RAID41. The Gunfight at the OK Corral on 26 October 1881 is one of the most enduring stories of the Old West. 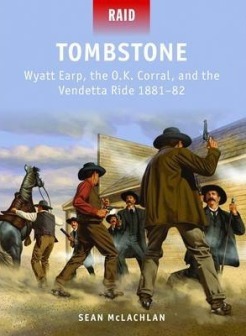 It led to a series of violent incidents that culminated in the Vendetta Ride, in which Wyatt Earp, Doc Holliday, and several other gunslingers went after their rivals the Cowboys. Like most tales of the Wild West, the facts are buried under layers of myth, and the line between good guys and bad guys is blurry. Wyatt Earp, leader of the so-called good guys, was charged with stealing horses in the Indian Territory in 1870 and jumped bail. Becoming a buffalo hunter and gambler, he got into several scrapes and earned a reputation as a gunfighter. Several times he helped lawmen arrest outlaws, but usually his assistance came more because of a personal grudge against the criminal than any real respect for law and order. He even got fired from a police job in Wichita for beating up a political rival.